Having been a travel writer/photographer for 30 years, a book had always been at the back of my mind. A couple of years ago I asked my friend, author Liz Hodgkinson, if she would ghost it for me which was to be about all the amazing coincidences that had happened in my life. "No!" she said, "You are going to write it and it’s going to be about animals." Many of the travel stories I had had published were about animals, so it was far easier than I’d imagined – recycling those anecdotes into my autobiography which took about four months. Liz edited it and my nephew, Rupert Vandervell, self-published it for me. Job done. As the plight of animals had been a lifelong passion, I decided to donate any profits to the animal charities listed in the appendix, including NATUREWATCH FOUNDATION. 'So in love with Africa were we that, for my 70th birthday and Martin’s 71st (both 5th October) in 2000, we treated one another to a trip to Zambia, kicking off with a flight up north to Ndola in the Copper Belt to visit the Chimfunshi Wildlife Orphanage and finishing up with a walking safari in the South Luangua Valley. David and Sheila Siddle started the Chimfunshi Wildlife Orphanage, after they accepted a badly injured infant chimp from a game ranger on their farm and nursed it back to health. An engineer by trade, Dave designed all the enclosures and handling facilities at Chimfunshi and pioneered many of the systems used by zoos and sanctuaries around the world. And in 2000, the year we were there, they had just opened two 500-acre enclosures for their chimps, still the largest area ever set aside for captive primates, and the closest thing to a wild release in Zambia had ever seen. Over the last 30 years Chimfunshi has provided a safe refuge for the hundreds of orphaned, injured and mistreated chimps, including, Toto, the chimp rescued from a circus in Chile while others have been found on airport luggage carousels, chained to the rooftops of African restaurants, taken from shoddy little zoos or kept in crates as pets. Dave’s day job was cattle farming which paid for the rescued chimps – with a little bit of help from two charities, Tusk Trust and WSPA. In 2002 both Dave and Sheila were awarded MBEs by the Queen and we met up with them at The Royal Geographical Society here in London where Sheila gave the annual Tusk Trust lecture to a full house and rapturous applause. Sadly, Dave died on 30th June 2006 at the age of 78 and at the time of his death, Chimfunshi was home to 112 chimps, making it one of the largest primate sanctuaries in the world. It was here at Chimfunshi in 2000 that I had come to meet my adopted chimp, six-year-old Thompson. On our first evening before my official photo-op with Thompson we were watching TV with month-old Miracle, a baby chimp born here but rejected by her mum and therefore hand-reared by Sheila. Miracle wore a nappy and knickers with her name embroidered on the front. Sheila let me hold her and she grabbed my hands tightly, just like human babies, and rose up on her feet, jumping up and down on my thighs. She was adorable. Suddenly Sheila leapt up off the sofa and shouted, "Oh my God, Billie!" She realised Martin had gone to the outside loo for a pee and hadn’t come back. Billie was a female five-year-old orphan hippo, born on the river running through the Siddle’s property. Her mother had been shot and Dave found her abandoned and dehydrated and brought her back to the house. She was fed milk in a gigantic bottle, reclining in the swimming pool the Siddles had built for their kids (luckily now having flown the nest) in the day time and sleeping on the sofa at night till it broke under her enormous weight and she was persuaded to sleep outside. Hippos kill more people in Africa than any other animal – and Martin was out there alone. In the dark and with a hippo on the loose. Sheila found him trapped in the loo with Billie’s gigantic head wedged in the doorway, unable to escape. He’d been shouting for help for the past half an hour but with the TV on we hadn’t heard his SOS. 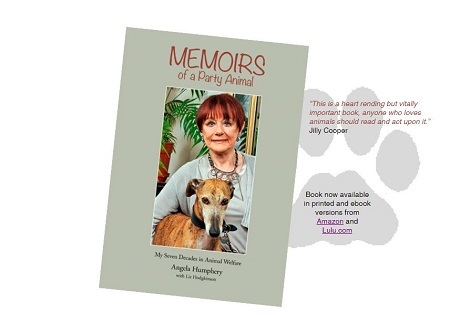 ‘A brilliant and essential read for all animal lovers and those with a sense of houmour’ – Peter Egan.